Jeep Wrangler Heater - Lets face it folks, although we love our Jeeps. They are no fun if you are freezing your tail off. Go out in the morning, start it up, turn the heat to defrost to clear off the ice. There is no warm air coming from the defrost vents!! Totally not good!! Or .. Driving down the road and you notice a slightly sweet acidic smell. You look in the passenger floorboard and notice a yellow/green fluid dripping down. Or .. even worse .. driving down the road and a mist of antifreeze suddenly sprays up the windshield. I had this happen in an old Camaro I once had. Along with the windshield being sprayed with the slimy green stuff. I also had antifreeze/water being dumped in the floor! I had to get out and do an emergency heater core bypass on the side of the road. Then drive home with my head hanging out the window because the inside was covered in slimy, slick, seemingly impossible to wash off antifreeze! True story!! Jeep Wrangler Heater - Make the YJ warm again! I kinda had a feeling that the blower motor was on it's way out because it would intermittently stop working and start up again. Strange because they usually just quit! Well .. sometime over the summer it gave up the ghost. I messed with it a few times and could never get it to come on. It cashed in ... time to get 'er fixed! YouTube video at the bottom demo'ing the repair. So, as of the typing this webpage it's late September, winter not too far off. I decided to get the blower motor fixed before winter came on full force. Once I got the box out and split open I seen discovered that the heater core was in fact leaking. I thought off and on that there was a very familiar sweet smell. But I never seen any obvious signs of wetness around the heater box or in the floor. Once I pulled the Jeep Wrangler heater box out and split the case. The evidence was there, discoloration in the fins of the core. It was obvious that there had been a slight leak. Not bad enough to drip or dump water anywhere. But just enough to occasionally emit that very distinct sweet smell. Once you have experienced that aroma, it will embed into your mind. Not that it really stinks, it's just has a smell all of it's own. 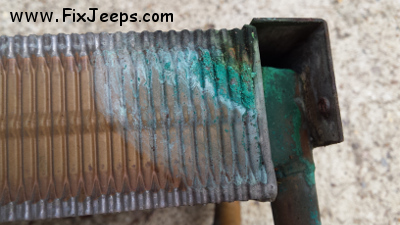 Luckily the heater core and blower motor in a Jeep Wrangler YJ are relatively easy to change. Unlike that old Camaro I once had, you don't need to remove the whole dash just to get to it. Just drop out the heater box, take the back off, change out the parts, then put 'er back together again. Never removing the dash. Heck, in a bind you can still drive the Wrangler with all that removed. Here are the part number to the part I used. You can probably find these parts through other suppliers. Personally I wasnt too impressed with these two products. I made them work as you can see in the video. But fitment wasn't on quality at all. But .. on the bright side. I got nice warm air coming from my defrost and heater vents.